When friends ask what it is like to take a camera down into the deep, I always tell them that it is quite similar to bringing down a 6 pound darkroom. Playing with light underwater can get rather tricky as instead of just dealing with the invisible air between you and the subject (on land), in the water, there’s an entire water column that separates you and the subject. And light. Light comes from the sun, which is directly above you and fades to black as you go deeper. The first color to vanish as you go deeper is red which is why new divers who get cut or bruised underwater panic upon seeing that their blood has turned green. Nope they’re not poisoned — the color red is merely absent. The first color to vanish as you go deeper is red which is why new divers who get cut or bruised underwater panic upon seeing that their blood has turned green. Speaking of color, the “black background w/ subject on foreground” is perhaps my favorite type of shot because of the sheer drama of isolating a subject and the eerie vibe it brings. Couple these emotions with playing around with negative space and my rather acolyte-level skills are put to a challenge. Mind you, I’m still learning. And if it is one thing I have learned with over 2 years shooting underwater is that patience is definitely the key. I used to spend very little time thinking about the subjects I shoot as other concerns as being pressed for air tend to take priority. But as I got more comfortable, I’ve learned that being patient and taking your time, especially taking time adjusting the lighting (strobe positions) really matter. My “documentary shots” now have a little more drama. Here are some of them. 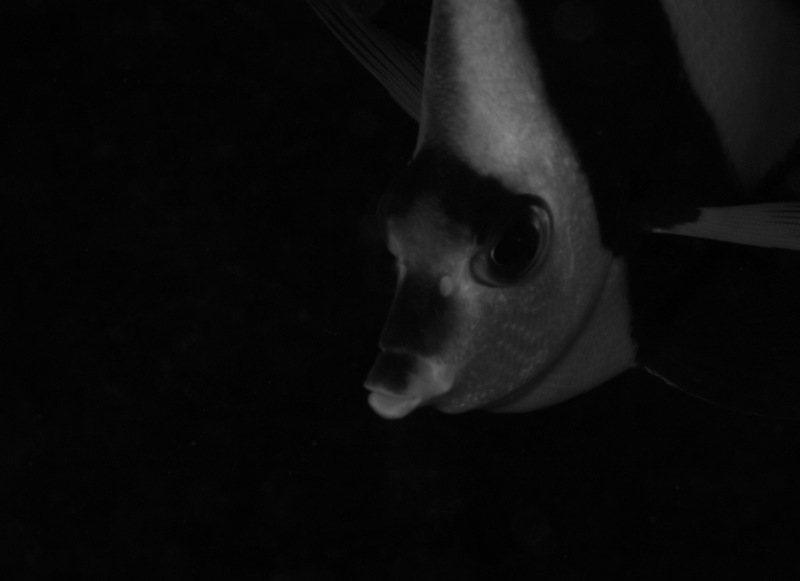 This is one of the variants of a butterfly fish, cropped at an angle and converted to black and white. It’s a cheat shot because the photo was taken too early and part of the subject is actually out of focus. The black and white effect allows the viewer to focus more on the patterns on the foreground in contrast with the negative background. This photo was taken in Anilao around November 2011 with a 60mm macro lens. 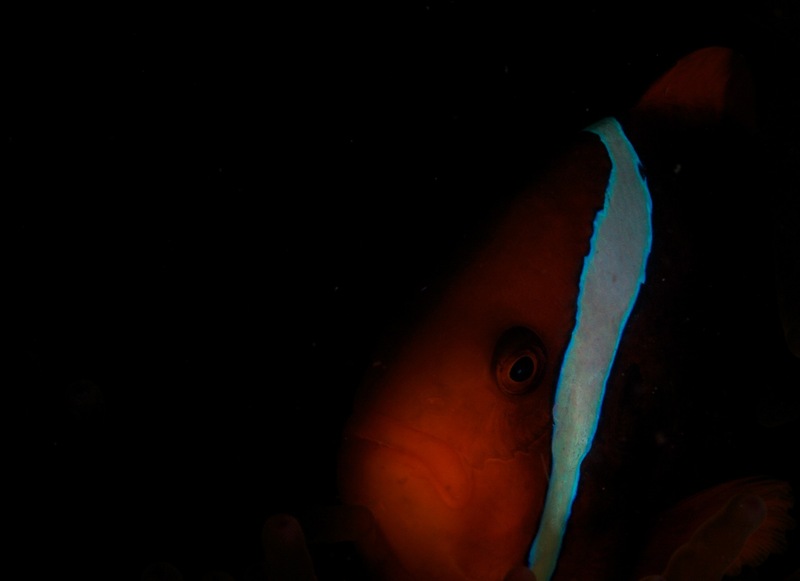 The tomato clown is a type of clownfish (aka “Nemo”) characterized by its plump red color and a white “gash” that runs vertically down its eye. At this point in my hobby I was making do with a single strobe, which results in an unbalanced photo creating shadows. However there are times when a single strobe can yield artistic results, such as this oblique portrait. The enemies of dark backgrounds are backscatter and silt. In the former’s case, strobe positioning really matters. The simplest trick is to push the strobes behind the camera, creating a sort of arrow with the tip being the lens at the middle. This photo was a finalist at the recent underwater photography competition organized by the PAWB (Protected Areas and Wildlife Bureau) of DENR. 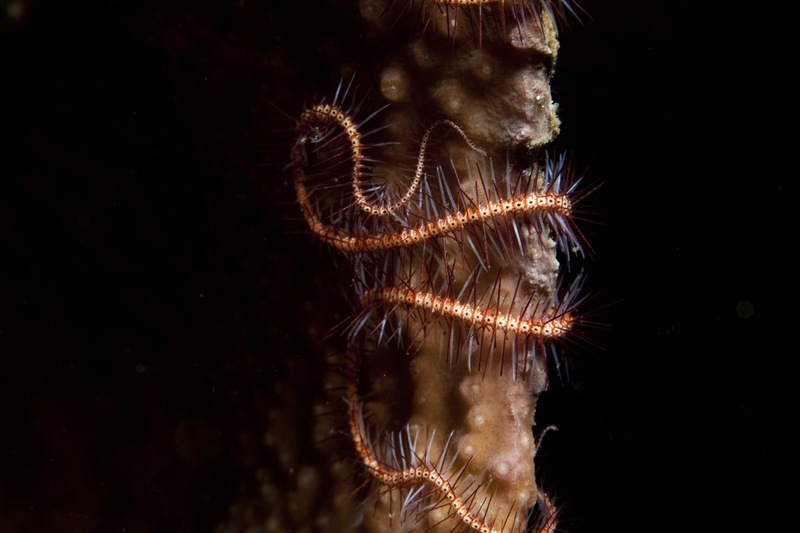 The theme for the year was “coral reefs” and this is a close up photo of an eerie brittle star wrapping itself around a barrel sponge coral. 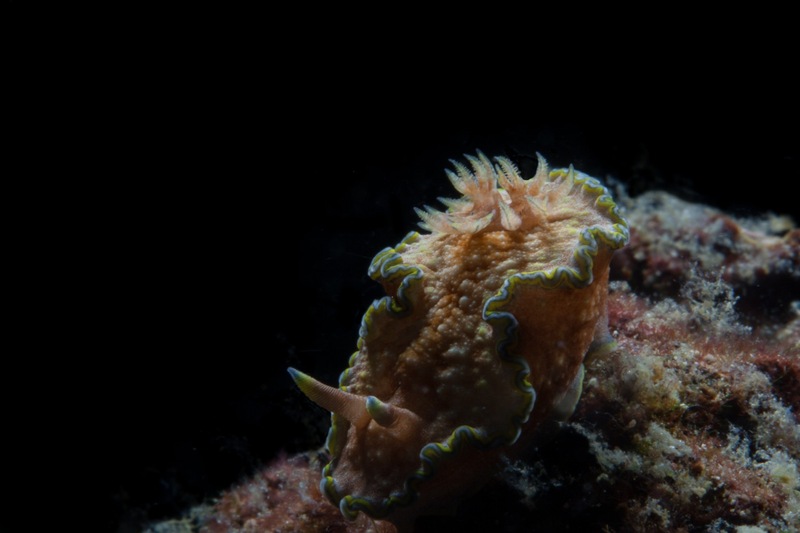 This photo of a nudibranch perched on a rock was one of my first successes with strobe positioning and a lot of patience. Both strobes were at a 10 and 2 o clock position to get the black background and the drama of the rhinopores (the antennae). I’m actually quite excited to road test a new setup using a point and shoot RX-100 Mark II from Sony. With minimum setup, I’ve seen dramatic shots that make use of good low light ISO and fast shutter speed and a dive torch for the light source. Tim Ho shoots without a strobe setup and uses a compact camera and a torch. Underwater photography need not be intimidating. Interested in SCUBA Diving and underwater photography? Send me a message and let me help you get started!